The motif of censorship can be found in all filmic genres. The reason lies mostly in an alleged “protection of society,” however, the basic rights such as freedom of expression and of the press get violated. Censored films tackle problems such as oppression, which mirror the collective unconscious of society and the ideological intentions of censorship authorities. 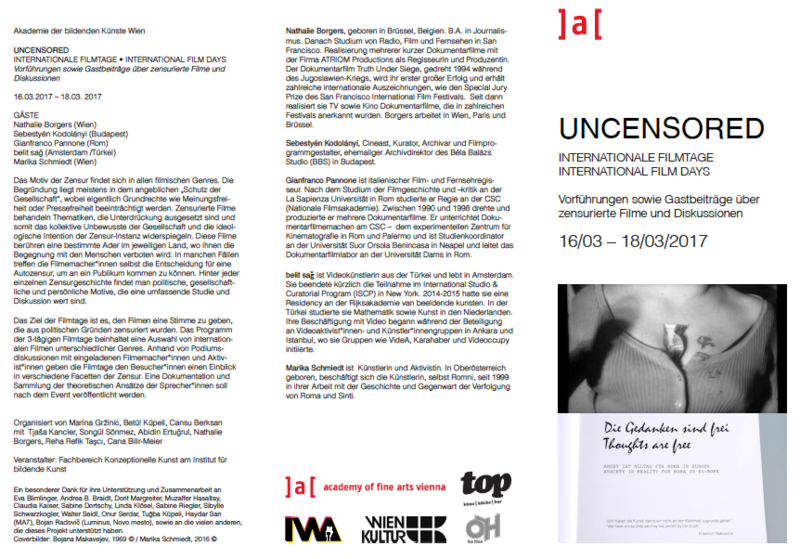 The films touch upon a very special issue in each country, where they cannot be shown to the public. In some cases, the filmmakers themselves even decide on auto-censorship to reach an audience. Behind every single history of censorship there are political, social and personal motifs which necessitate comprehensive study and discussion. The aim of the film days is to lend those films a voice, which have been censored out of political reasons. The three-day program consists of a selection of international films of various genres. For the audience, the panel discussions with invited filmmakers and activists give insight into several forms of censorship. A collection of all theoretical contributions of the invited speakers should be published after the event. Ayhan Çarkın was a police officer active in the Kurdish region in Turkey during the 1990s. He was involved in underground groups formed by police officers who were killing Kurdish people with the order of the State. He had a bad conscious and started to confess. In its early stage the original concept for the video was censored in Turkey. This video talks about the censorship it went through, while reflecting about violence and the image. The lecture tries to map the modes and behaviors of censorship in the Eastern European countries, from the time of socialist modernization to nowadays. It reflects as well on anomalies of artistic behaviors and misinterpretations of censorships, such as self-victimization and self-censorship. The legal frames of aggressive control over the redistribution of cultural subventions are in the present democratic societies more effective than the “good old” censorship strategies. 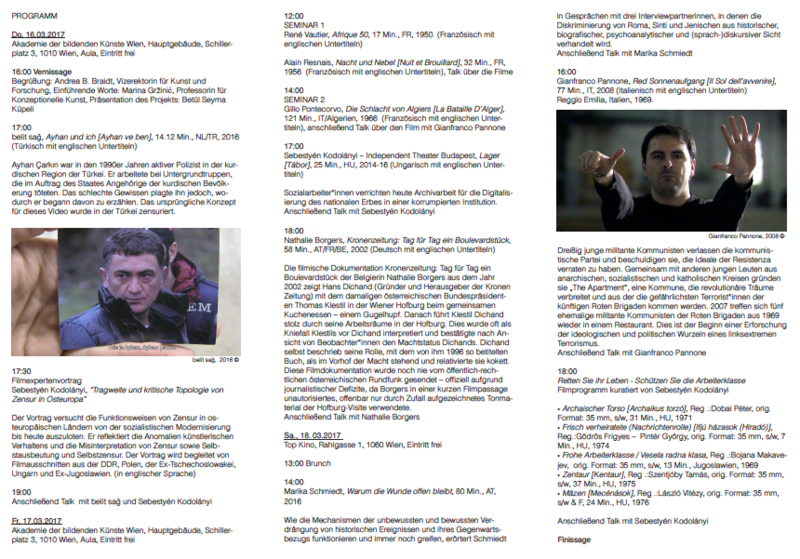 The lecture will be illustrated with excerpts from films made in the German Democratic Republic, Poland, ex-Czechoslovakia, Hungary and ex-Yugoslavia. Community workers are doing their archival job now for the sake of the digitalization of the national heritage inside a corrupted institution. The documentary CITIZEN KRONE (2002) by Belgian filmmaker Nathalie Borgers shows Hans Dichand (Founder and publisher of the Kronen-Newspaper) with the former Austrian president Thomas Klestil in Vienna’s Hofburg while having cake – a Gugelhupf. Thereafter, Klestil eagerly leads Dichand through his offices at the Hofburg. This has been often interpreted as Klestil’s going down on his knees in front of Dichand, and, according to observers, testifies to Dichand’s status of power. In his 1996 book, Dichand himself described his role as being in the “atrium of power” (also the title of his book), but nonchalantly relativized this stance later. This documentary film has never been shown by Austria’s public broadcasting station, a decision officially justified by “journalistic deficits” because in one short instance, Borgers used unauthorized, accidental audio material of this visit to the Hofburg. In her interviews, Schmiedt discusses how the mechanism of conscious and unconscious repression of historical events and their relevance for the present is still lingering. Her discussion partners address the discrimination of Sinti, Romani and Yenish out of historical, biographical, psychoanalytical and linguistic/discursive reasons. Reggio Emilia, Italy, 1969. Thirty young militant communists leave the Communist Party, accusing it of having betrayed the ideals of the Resistenza, and, together with other young people of anarchic, socialist and catholic extraction, they form The Apartment, a commune where revolutionary dreams are bandied around and where the most dangerous terrorists of the future Red Brigades will come from. In 2007, five former militant communists from those Red Brigades of 1969 meet again in a restaurant: it’s the beginning of the first exploration of the ideological and political roots of the far-lefts terrorism. Sebestyén Kodolányi, cineaste, curator, archivist and film programmer; former archive director of the Béla Balázs Studio (BBS) in Budapest. Gianfranco Pannone is an Italian film and television director. After graduating in Cinema history and criticism at La Sapienza University of Rome, he graduated in Directing at the CSC (National Cinema School). Between 1990 and 1998, he directed and produced several documentary films. He teaches documentary filmmaking at CSC – Experimental Centre of Cinematography in Rome and Palermo and is teaching coordinator of the Master Film and Television program at the University Suor Orsola Benincasa in Naples, as well as head of the documentary film laboratory at Dams in Rome. From 1990 until today Pannone has made many documentary films dedicated to the complex history of his country, Italy.